The most frequently discussed Samba subjects over the past 2 years have focused around domain control and printing. It is well known that Samba is a file and print server. A recent survey conducted by Open Magazine found that of all respondents, 97 percent use Samba for file and print services, and 68 percent use Samba for Domain Control. See the Open-Mag Web site for current information. The survey results as found on January 14, 2004, are shown in “Open Magazine Samba Survey”. While domain control is an exciting subject, basic file and print sharing remains the staple bread-and-butter function that Samba provides. Yet this book may give the appearance of having focused too much on more exciting aspects of Samba deployment. This chapter directs your attention to provide important information on the addition of Samba servers into your present Windows network whatever the controlling technology may be. So let's get back to our good friends at Abmas. Looking back over the achievements of the past year or two, daily events at Abmas are rather straightforward with not too many distractions or problems. Your team is doing well, but a number of employees are asking for Linux desktop systems. Your network has grown and demands additional domain member servers. Let's get on with this; Christine and Stan are ready to go. Stan is firmly in control of the department of the future, while Christine is enjoying a stable and predictable network environment. It is time to add more servers and to add Linux desktops. It is time to meet the demands of future growth and endure trial by fire. You must now add UNIX/Linux domain member servers to your network. You have a friend who has a Windows 2003 Active Directory domain network who wants to add a Samba/Linux server and has asked Christine to help him out. Your real objective is to help Christine to see more of the way the Microsoft world lives and use her help to get validation that Samba really does live up to expectations. Over the past 6 months, you have hired several new staff who want Linux on their desktops. You must integrate these systems to make sure that Abmas is not building islands of technology. You ask Christine to do likewise at Swodniw Biz NL (your friend's company) to help them to evaluate a Linux desktop. You want to make the right decision, don't you? Recent Samba mailing-list activity is witness to how many sites are using winbind. Some have no trouble at all with it, yet to others the problems seem insurmountable. Periodically there are complaints concerning an inability to achieve identical user and group IDs between Windows and UNIX environments. You provide step-by-step implementations of the various tools that can be used for identity resolution. You also provide working examples of solutions for integrated authentication for both UNIX/Linux and Windows environments. One of the great challenges we face when people ask us, “What is the best way to solve this problem?” is to get beyond the facts so we not only can clearly comprehend the immediate technical problem, but also can understand how needs may change. A domain controller (PDC or BDC) is always authoritative for all accounts in its domain. This means that a BDC must (of necessity) be able to resolve all account UIDs and GIDs to the same values that the PDC resolved them to. A domain member can be authoritative for local accounts, but is never authoritative for domain accounts. If a user is accessing a domain member server and that user's account is not known locally, the domain member server must resolve the identity of that user from the domain in which that user's account resides. It must then map that ID to a UID/GID pair that it can use locally. This is handled by winbindd. By executing a system getpwnam() or getgrnam() call. On systems that support it, this utilizes the name service switch (NSS) facility to resolve names according to the configuration of the /etc/nsswitch.conf file. NSS can be configured to use LDAP, winbind, NIS, or local files. Performing, via NSS, a direct LDAP search (where an LDAP passdb backend has been configured). This requires the use of the PADL nss_ldap tool (or equivalent). Directly by querying winbindd. The winbindd contacts a domain controller to attempt to resolve the identity of the user or group. It receives the Windows networking security identifier (SID) for that appropriate account and then allocates a local UID or GID from the range of available IDs and creates an entry in its winbindd_idmap.tdb and winbindd_cache.tdb files. If the parameter idmap backend = ldap:ldap://myserver.domain was specified and the LDAP server has been configured with a container in which it may store the IDMAP entries, all domain members may share a common mapping. Irrespective of how smb.conf is configured, winbind creates and caches a local copy of the ID mapping database. It uses the winbindd_idmap.tdb and winbindd_cache.tdb files to do this. Which of the resolver methods is chosen is determined by the way that Samba is configured in the smb.conf file. Some of the configuration options are rather less than obvious to the casual user. If you wish to make use of accounts (users and/or groups) that are local to (i.e., capable of being resolved using) the NSS facility, it is possible to use the winbind trusted domains only = Yes in the smb.conf file. This parameter specifically applies to domain controllers, and to domain member servers. For many administrators, it should be plain that the use of an LDAP-based repository for all network accounts (both for POSIX accounts and for Samba accounts) provides the most elegant and controllable facility. You eventually appreciate the decision to use LDAP. If your network account information resides in an LDAP repository, you should use it ahead of any alternative method. This means that if it is humanly possible to use the nss_ldap tools to resolve UNIX account UIDs/GIDs via LDAP, this is the preferred solution, because it provides a more readily controllable method for asserting the exact same user and group identifiers throughout the network. In the situation where UNIX accounts are held on the domain member server itself, the only effective way to use them involves the smb.conf entry winbind trusted domains only = Yes. This forces Samba (smbd) to perform a getpwnam() system call that can then be controlled via /etc/nsswitch.conf file settings. The use of this parameter disables the use of Samba with trusted domains (i.e., external domains). Winbind can be used to create an appliance mode domain member server. In this capacity, winbindd is configured to automatically allocate UIDs/GIDs from numeric ranges set in the smb.conf file. The allocation is made for all accounts that connect to that domain member server, whether within its own domain or from trusted domains. If not stored in an LDAP backend, each domain member maintains its own unique mapping database. This means that it is almost certain that a given user who accesses two domain member servers does not have the same UID/GID on both servers however, this is transparent to the Windows network user. This data is stored in the winbindd_idmap.tdb and winbindd_cache.tdb files. The use of an LDAP backend for the Winbind IDMAP facility permits Windows domain SIDs mappings to UIDs/GIDs to be stored centrally. The result is a consistent mapping across all domain member servers so configured. This solves one of the major headaches for network administrators who need to copy files between or across network file servers. One of the most fierce conflicts recently being waged is resistance to the adoption of LDAP, in particular OpenLDAP, as a replacement for UNIX NIS (previously called Yellow Pages). Let's face it, LDAP is different and requires a new approach to the need for a better identity management solution. The more you work with LDAP, the more its power and flexibility emerges from its dark, cavernous chasm. LDAP is a most suitable solution for heterogenous environments. If you need crypto, add Kerberos. The reason these are preferable is because they are heterogenous. Windows solutions of this sort are not heterogenous by design. This is fundamental it isn't religious or political. This also doesn't say that you can't use Windows Active Directory in a heterogenous environment it can be done, it just requires commercial integration products. But it's not what Active Directory was designed for. A number of long-term UNIX devotees have recently commented in various communications that the Samba Team is the first application group to almost force network administrators to use LDAP. It should be pointed out that we resisted this for as long as we could. It is not out of laziness or malice that LDAP has finally emerged as the preferred identity management backend for Samba. We recommend LDAP for your total organizational directory needs. The domain member server and the domain member client are at the center of focus in this chapter. Configuration of Samba-3 domain controller is covered in earlier chapters, so if your interest is in domain controller configuration, you will not find that here. You will find good oil that helps you to add domain member servers and clients. In practice, domain member servers and domain member workstations are very different entities, but in terms of technology they share similar core infrastructure. A technologist would argue that servers and workstations are identical. Many users would argue otherwise, given that in a well-disciplined environment a workstation (client) is a device from which a user creates documents and files that are located on servers. A workstation is frequently viewed as a disposable (easy to replace) item, but a server is viewed as a core component of the business. We can look at this another way. If a workstation breaks down, one user is affected, but if a server breaks down, hundreds of users may not be able to work. The services that a workstation must provide are document- and file-production oriented; a server provides information storage and is distribution oriented. Why is this important? For starters, we must identify what components of the operating system and its environment must be configured. Also, it is necessary to recognize where the interdependencies between the various services to be used are. In particular, it is important to understand the operation of each critical part of the authentication process, the logon process, and how user identities get resolved and applied within the operating system and applications (like Samba) that depend on this and may actually contribute to it. So, in this chapter we demonstrate how to implement the technology. It is done within a context of what type of service need must be fulfilled. 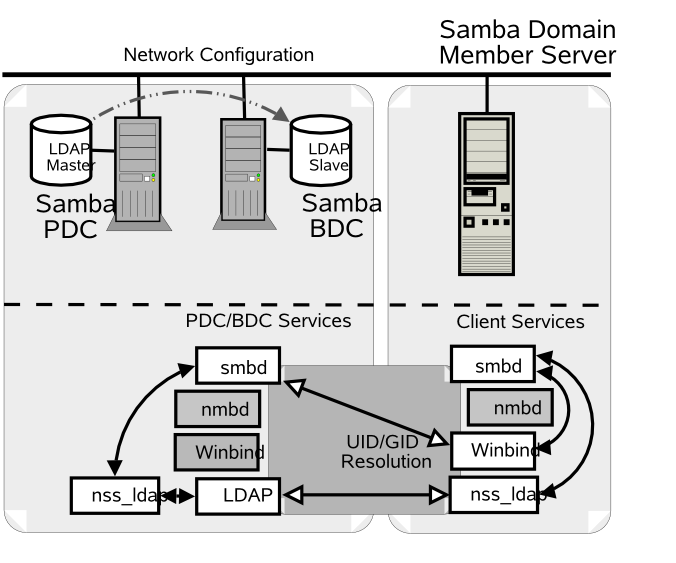 In this example, it is assumed that you have Samba PDC/BDC servers. This means you are using an LDAP ldapsam backend. We are adding to the LDAP backend database (directory) containers for use by the IDMAP facility. This makes it possible to have globally consistent mapping of SIDs to and from UIDs and GIDs. This means that it is necessary to run winbindd as part of your configuration. The primary purpose of running winbindd (within this operational context) is to permit mapping of foreign SIDs (those not originating from the the local Samba server). Foreign SIDs can come from any domain member client or server, or from Windows clients that do not belong to a domain. Another way to explain the necessity to run winbindd is that Samba can locally resolve only accounts that belong to the security context of its own machine SID. Winbind handles all non-local SIDs and maps them to a local UID/GID value. The UID and GID are allocated from the parameter values set in the smb.conf file for the idmap uid and idmap gid ranges. Where LDAP is used, the mappings can be stored in LDAP so that all domain member servers can use a consistent mapping. If your installation is accessed only from clients that are members of your own domain, and all user accounts are present in a local passdb backend then it is not necessary to run winbindd. The local passdb backend can be in smbpasswd, tdbsam, or in ldapsam. Accounts in /etc/passwd or in /etc/group. Resolution via NSS. On NSS-enabled systems, there is usually a facility to resolve IDs via multiple methods. The methods typically include files, compat, db, ldap, nis, nisplus, hesiod. When correctly installed, Samba adds to this list the winbindd facility. The ldap facility is frequently the nss_ldap tool provided by PADL Software. To advoid confusion the use of the term local passdb backend means that the user account backend is not shared by any other Samba server instead, it is used only locally on the Samba domain member server under discussion. The diagram in “Samba Domain: Samba Member Server” demonstrates the relationship of Samba and system components that are involved in the identity resolution process where Samba is used as a domain member server within a Samba domain control network. In this example configuration, Samba will directly search the LDAP-based passwd backend ldapsam to obtain authentication and user identity information. The IDMAP information is stored in the LDAP backend so that it can be shared by all domain member servers so that every user will have a consistent UID and GID across all of them. The IDMAP facility will be used for all foreign (i.e., not having the same SID as the domain it is a member of) domains. The configuration of NSS will ensure that all UNIX processes will obtain a consistent UID/GID. The instructions given here apply to the Samba environment shown in “Making Happy Users” and “A Distributed 2000-User Network”. If the network does not have an LDAP slave server (i.e., “Making Happy Users” configuration), change the target LDAP server from lapdc to massive. Create the smb.conf file as shown in “Samba Domain Member in Samba Domain Using LDAP smb.conf File”. Locate this file in the directory /etc/samba. Configure the file that will be used by nss_ldap to locate and communicate with the LDAP server. This file is called ldap.conf. If your implementation of nss_ldap is consistent with the defaults suggested by PADL (the authors), it will be located in the /etc directory. On some systems, the default location is the /etc/openldap directory, however this file is intended for use by the OpenLDAP utilities and should not really be used by the nss_ldap utility since its content and structure serves the specific purpose of enabling the resolution of user and group IDs via NSS. Configure the NSS control file so it matches the one shown in “NSS using LDAP for Identity Resolution File: /etc/nsswitch.conf”. You should notice the location of the users' home directories. First, make certain that the home directories exist on the domain member server; otherwise, the home directory share is not available. The home directories could be mounted off a domain controller using NFS or by any other suitable means. Second, the absence of the domain name in the home directory path is indicative that identity resolution is not being done via winbind. This shows that all is working as it should be. Notice that in the LDAP database the users' primary and secondary group memberships are identical. It is not necessary to add secondary group memberships (in the group database) if the user is already a member via primary group membership in the password database. When using winbind, it is in fact undesirable to do this because it results in doubling up of group memberships and may cause problems with winbind under certain conditions. It is intended that these limitations with winbind will be resolved soon after Samba-3.0.20 has been released. This indicates that the domain join succeeded. Broken resolution of NetBIOS names to the respective IP address. Incorrect username and password credentials. The NT4 restrict anonymous is set to exclude anonymous connections. Note: Use "root" for UNIX/Linux and Samba, use "Administrator" for Windows NT4/200X. If the cause of the failure appears to be related to a rejected or failed NT_SESSION_SETUP* or an error message that says NT_STATUS_ACCESS_DENIED immediately check the Windows registry setting that controls the restrict anonymous setting. Set this to the value 0 so that an anonymous connection can be sustained, then try again. The configuration is now ready to obtain the Samba domain user and group information. You may now start Samba in the usual manner, and your Samba domain member server is ready for use. Just add shares as required. LDAP support (client) is not installed on the system. There are mitigating circumstances forcing a decision not to use LDAP. The Samba domain member server must be part of a Windows NT4 Domain, or a Samba Domain. Later in the chapter, you can see how to configure a Samba domain member server for a Windows ADS domain. Right now your objective is to configure a Samba server that can be a member of a Windows NT4-style domain and/or does not use LDAP. If you use winbind for identity resolution, make sure that there are no duplicate accounts. For example, do not have more than one account that has UID=0 in the password database. If there is an account called root in the /etc/passwd database, it is okay to have an account called root in the LDAP ldapsam or in the tdbsam. But if there are two accounts in the passdb backend that have the same UID, winbind will break. This means that the Administrator account must be called root. Winbind will break if there is an account in /etc/passwd that has the same UID as an account that is in LDAP ldapsam (or in tdbsam) but that differs in name only. The following configuration uses CIFS/SMB protocols alone to obtain user and group credentials. The winbind information is locally cached in the winbindd_cache.tdb winbindd_idmap.tdb files. This provides considerable performance benefits compared with the LDAP solution, particularly where the LDAP lookups must traverse WAN links. You may examine the contents of these files using the tool tdbdump, though you may have to build this from the Samba source code if it has not been supplied as part of a binary package distribution that you may be using. Using your favorite text editor, create the smb.conf file so it has the contents shown in “Samba Domain Member Server Using Winbind smb.conf File for NT4 Domain”. Edit the /etc/nsswitch.conf so it has the entries shown in “NSS using LDAP for Identity Resolution File: /etc/nsswitch.conf”. This indicates that the domain join succeed. This shows that domain users have been listed correctly. This shows that domain groups have been correctly obtained also. The next step verifies that NSS is able to obtain this information correctly from winbind also. The user account information has been correctly obtained. This information has been merged with the winbind template information configured in the smb.conf file. The Samba member server of a Windows NT4 domain is ready for use. No matter how many UNIX/Linux administrators there may be who believe that a UNIX operating system that does not have NSS and PAM support to be outdated, the fact is there are still many such systems in use today. Samba can be used without NSS support, but this does limit it to the use of local user and group accounts only. The following steps may be followed to implement Samba with support for local accounts. In this configuration Samba is made a domain member server. All incoming connections to the Samba server will cause the look-up of the incoming username. If the account is found, it is used. If the account is not found, one will be automatically created on the local machine so that it can then be used for all access controls. Using your favorite text editor, create the smb.conf file so it has the contents shown in “Samba Domain Member Server Using Local Accounts smb.conf File for NT4 Domain”. Be sure to run all three Samba daemons: smbd, nmbd, winbindd. One of the much-sought-after features new to Samba-3 is the ability to join an Active Directory domain using Kerberos protocols. This makes it possible to operate an entire Windows network without the need to run NetBIOS over TCP/IP and permits more secure networking in general. An exhaustively complete discussion of the protocols is not possible in this book; perhaps a later book may explore the intricacies of the NetBIOS-less operation that Samba-3 can participate in. For now, we simply focus on how a Samba-3 server can be made a domain member server. 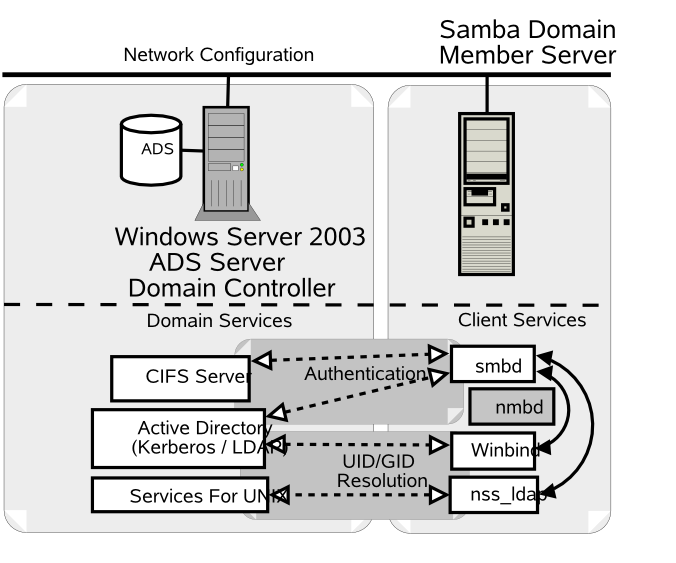 The diagram in “Active Directory Domain: Samba Member Server” demonstrates how Samba-3 interfaces with Microsoft Active Directory components. It should be noted that if Microsoft Windows Services for UNIX (SFU) has been installed and correctly configured, it is possible to use client LDAP for identity resolution just as can be done with Samba-3 when using an LDAP passdb backend. The UNIX tool that you need for this, as in the case of LDAP on UNIX/Linux, is the PADL Software nss_ldap tool-set. Compared with use of winbind and Kerberos, the use of LDAP-based identity resolution is a little less secure. In view of the fact that this solution requires additional software to be installed on the Windows 200x ADS domain controllers, and that means more management overhead, it is likely that most Samba-3 ADS client sites may elect to use winbind. Do not attempt to use this procedure if you are not 100 percent certain that the build of Samba-3 you are using has been compiled and linked with all the tools necessary for this to work. Given the importance of this step, you must first validate that the Samba-3 message block daemon (smbd) has the necessary features. The hypothetical domain you are using in this example assumes that the Abmas London office decided to take its own lead (some would say this is a typical behavior in a global corporate world; besides, a little divergence and conflict makes for an interesting life). The Windows Server 2003 ADS domain is called london.abmas.biz and the name of the server is W2K3S. In ADS realm terms, the domain controller is known as w2k3s.london.abmas.biz. In NetBIOS nomenclature, the domain name is LONDON and the server name is W2K3S. This does look promising; smbd has been built with Kerberos and LDAP support. You are relieved to know that it is safe to progress. Please note that the RPMs provided by the Samba-Team are known to be working and have been validated. Red Hat Linux RPMs may be obtained from the Samba FTP sites. SUSE Linux RPMs may be obtained from Sernet in Germany. From this point on, you are certain that the Samba-3 build you are using has the necessary capabilities. You can now configure Samba-3 and the NSS. Using you favorite editor, configure the smb.conf file that is located in the /etc/samba directory so that it has the contents shown in “Samba Domain Member smb.conf File for Active Directory Membership”. Edit or create the NSS control file so it has the contents shown in “NSS using LDAP for Identity Resolution File: /etc/nsswitch.conf”. Delete the file /etc/samba/secrets.tdb if it exists. Of course, you do keep a backup, don't you? Now that you are satisfied that your Samba server is ready to join the Windows ADS domain, let's move on. You have successfully made your Samba-3 server a member of the ADS domain using Kerberos protocols. Defective or misconfigured DNS name resolution. Restrictive security settings on the Windows 200x ADS domain controller preventing needed communications protocols. You can check this by searching the Windows Server 200x Event Viewer. Incorrectly configured smb.conf file settings. Lack of support of necessary Kerberos protocols because the version of MIT Kerberos (or Heimdal) in use is not up to date enough to support the necessary functionality. In any case, never execute the net rpc join command in an attempt to join the Samba server to the domain, unless you wish not to use the Kerberos security protocols. Use of the older RPC-based domain join facility requires that Windows Server 200x ADS has been configured appropriately for mixed mode operation. This is given to demonstrate to the skeptics that this process truly does work. It is now time to start Samba in the usual way (as has been done many time before in this book). Excellent. That worked also, as expected. This is very pleasing. Everything works as expected. It should be noted that Kerberos protocols are time-clock critical. You should keep all server time clocks synchronized using the network time protocol (NTP). In any case, the output we obtained confirms that all systems are operational. And now you have conclusive proof that your Samba-3 ADS domain member server called FRAN is able to communicate fully with the ADS domain controllers. Now all is revealed. Your curiosity, as well as that of your team, has been put at ease. May this server serve well all who happen upon it. This alternate method of SID to UID/GID mapping can be achieved with the idmap_rid plug-in. This plug-in uses the RID of the user SID to derive the UID and GID by adding the RID to a base value specified. This utility requires that the parameter “allow trusted domains = No” must be specified, as it is not compatible with multiple domain environments. The idmap uid and idmap gid ranges must be specified. The idmap_rid facility can be used both for NT4/Samba-style domains as well as with Active Directory. To use this with an NT4 domain, the realm is not used. Additionally the method used to join the domain uses the net rpc join process. An example smb.conf file for an ADS domain environment is shown in “Example smb.conf File Using idmap_rid”. In a large domain with many users, it is imperative to disable enumeration of users and groups. For example, at a site that has 22,000 users in Active Directory the winbind-based user and group resolution is unavailable for nearly 12 minutes following first start-up of winbind. Disabling of such enumeration results in instantaneous response. The disabling of user and group enumeration means that it will not be possible to list users or groups using the getent passwd and getent group commands. It will be possible to perform the lookup for individual users, as shown in the procedure below. Create or install and smb.conf file with the above configuration. The specific error message may differ from the above because it depends on the type of failure that may have occurred. Increase the log level to 10, repeat the above test, and then examine the log files produced to identify the nature of the failure. The storage of IDMAP information in LDAP can be used with both NT4/Samba-3-style domains as well as with ADS domains. OpenLDAP is a commonly used LDAP server for this purpose, although any standards-compliant LDAP server can be used. It is therefore possible to deploy this IDMAP configuration using the Sun iPlanet LDAP server, Novell eDirectory, Microsoft ADS plus ADAM, and so on. The example in “Typical ADS Style Domain smb.conf File” is for an ADS-style domain. In the case of an NT4 or Samba-3-style domain the realm is not used, and the command used to join the domain is net rpc join. The above example also demonstrates advanced error reporting techniques that are documented in the chapter called "Reporting Bugs" in “The Official Samba-3 HOWTO and Reference Guide, Second Edition” (TOSHARG2). Create the /etc/krb5.conf file following the indications above. Follow the diagnostic procedures shown earlier in this chapter to identify success or failure of the join. In many cases a failure is indicated by a silent return to the command prompt with no indication of the reason for failure. The use of this method is messy. The information provided in this section is for guidance only and is very definitely not complete. This method does work; it is used in a number of large sites and has an acceptable level of performance. An example smb.conf file is shown in “ADS Membership Using RFC2307bis Identity Resolution smb.conf File”. The /etc/ldap.conf file must be configured also. Refer to the PADL documentation and source code for nss_ldap instructions. The next step involves preparation on the ADS schema. This is briefly discussed in the remaining part of this chapter. The Microsoft Windows Service for UNIX version 3.5 is available for free download from the Microsoft Web site. You will need to download this tool and install it following Microsoft instructions. So far this chapter has been mainly concerned with the provision of file and print services for domain member servers. However, an increasing number of UNIX/Linux workstations are being installed that do not act as file or print servers to anyone other than a single desktop user. The key demand for desktop systems is to be able to log onto any UNIX/Linux or Windows desktop using the same network user credentials. Samba winbind (free). Samba-3.0.20 introduced a complete replacement for Winbind that now provides a greater level of scalability in large ADS environments. PADL PAM and LDAP tools (free). Centrify DirectControl (commercial). Centrify's commercial product allows UNIX and Linux systems to use Active Directory security, directory and policy services. Enhancements include a centralized ID mapping that allows Samba, DirectControl and Active Directory to seamlessly work together. The following guidelines are pertinent to the deployment of winbind-based authentication and identity resolution with the express purpose of allowing users to log on to UNIX/Linux desktops using Windows network domain user credentials (username and password). You should note that it is possible to use LDAP-based PAM and NSS tools to permit distributed systems logons (SSO), providing user and group accounts are stored in an LDAP directory. This provides logon services for UNIX/Linux users, while Windows users obtain their sign-on support via Samba-3. On the other hand, if the authentication and identity resolution backend must be provided by a Windows NT4-style domain or from an Active Directory Domain that does not have the Microsoft Windows Services for UNIX installed, winbind is your best friend. Specific guidance for these situations now follows. To permit users to log on to a Linux system using Windows network credentials, you need to configure identity resolution (NSS) and PAM. This means that the basic steps include those outlined above with the addition of PAM configuration. Given that most workstations (desktop/client) usually do not need to provide file and print services to a group of users, the configuration of shares and printers is generally less important. Often this allows the share specifications to be entirely removed from the smb.conf file. That is obviously an administrator decision. Follow the steps outlined in “NT4/Samba Domain with Samba Domain Member Server: Using NSS and Winbind” and ensure that all validation tests function as shown. Identify what services users must log on to. On Red Hat Linux, if it is intended that the user shall be given access to all services, it may be most expeditious to simply configure the file /etc/pam.d/system-auth. Carefully make a backup copy of all PAM configuration files before you begin making changes. If you break the PAM configuration, please note that you may need to use an emergency boot process to recover your Linux system. It is possible to break the ability to log into the system if PAM files are incorrectly configured. The entire directory /etc/pam.d should be backed up to a safe location. If you require only console login support, edit the /etc/pam.d/login so it matches “SUSE: PAM login Module Using Winbind”. To provide the ability to log onto the graphical desktop interface, you must edit the files gdm and xdm in the /etc/pam.d directory. Edit only one file at a time. Carefully validate its operation before attempting to reboot the machine. This procedure should be followed to permit a Linux network client (workstation/desktop) to permit users to log on using Microsoft Active Directory-based user credentials. Follow the steps outlined in “Active Directory Domain with Samba Domain Member Server” and ensure that all validation tests function as shown. Identify what services users must log on to. On Red Hat Linux, if it is intended that the user shall be given access to all services, it may be most expeditious to simply configure the file /etc/pam.d/system-auth as shown in “Red Hat 9: PAM System Authentication File: /etc/pam.d/system-auth Module Using Winbind”. The addition of UNIX/Linux Samba servers and clients is a common requirement. In this chapter, you learned how to integrate such servers so that the UID/GID mappings they use can be consistent across all domain member servers. You also discovered how to implement the ability to use Samba or Windows domain account credentials to log on to a UNIX/Linux client. Domain controllers are always authoritative for the domain. Domain members may have local accounts and must be able to resolve the identity of domain user accounts. Domain user account identity must map to a local UID/GID. That local UID/GID can be stored in LDAP. This way, it is possible to share the IDMAP data across all domain member machines. Resolution of user and group identities on domain member machines may be implemented using direct LDAP services or using winbind. On NSS/PAM enabled UNIX/Linux systems, NSS is responsible for identity management and PAM is responsible for authentication of logon credentials (username and password). The following questions were obtained from the mailing list and also from private discussions with Windows network administrators. We use NIS for all UNIX accounts. Why do we need winbind? Our IT management people do not like LDAP but are looking at Microsoft Active Directory. Which is better? We want to implement a Samba PDC, four Samba BDCs, and 10 Samba servers. Is it possible to use NIS in place of LDAP? Are you suggesting that users should not log on to a domain member server? If so, why? We want to ensure that only users from our own domain plus from trusted domains can use our Samba servers. In the smb.conf file on all servers, we have enabled the winbind trusted domains only parameter. We now find that users from trusted domains cannot access our servers, and users from Windows clients that are not domain members can also access our servers. Is this a Samba bug? What are the benefits of using LDAP for my domain member servers? Is proper DNS operation necessary for Samba-3 plus LDAP? If so, what must I put into my DNS configuration? Our Windows 2003 Server Active Directory domain runs with NetBIOS disabled. Can we use Samba-3 with that configuration? When I tried to execute net ads join, I got no output. It did not work, so I think that it failed. I then executed net rpc join and that worked fine. That is okay, isn't it? You can use NIS for your UNIX accounts. NIS does not store the Windows encrypted passwords that need to be stored in one of the acceptable passdb backends. Your choice of backend is limited to smbpasswd or tdbsam. Winbind is needed to handle the resolution of SIDs from trusted domains to local UID/GID values. On a domain member server, you effectively map Windows domain users to local users that are in your NIS database by specifying the winbind trusted domains only. This causes user and group account lookups to be routed via the getpwnam() family of systems calls. On an NIS-enabled client, this pushes the resolution of users and groups out through NIS. As a general rule, it is always a good idea to run winbind on all Samba servers. Microsoft Active Directory is an LDAP server that is intricately tied to a Kerberos infrastructure. Most IT managers who object to LDAP do so because an LDAP server is most often supplied as a raw tool that needs to be configured and for which the administrator must create the schema, create the administration tools, and devise the backup and recovery facilities in a site-dependent manner. LDAP servers in general are seen as a high-energy, high-risk facility. Microsoft Active Directory by comparison is easy to install and configure and is supplied with all tools necessary to implement and manage the directory. For sites that lack a lot of technical competence, Active Directory is a good choice. For sites that have the technical competence to handle Active Directory well, LDAP is a good alternative. The real issue is, What type of solution does the site want? If management wants a choice to use an alternative, they may want to consider the options. On the other hand, if management just wants a solution that works, Microsoft Active Directory is a good solution. Yes, it is possible to use NIS in place of LDAP, but there may be problems with keeping the Windows (SMB) encrypted passwords database correctly synchronized across the entire network. Workstations (Windows client machines) periodically change their domain membership secure account password. How can you keep changes that are on remote BDCs synchronized on the PDC? LDAP is a more elegant solution because it permits centralized storage and management of all network identities (user, group, and machine accounts) together with all information Samba needs to provide to network clients and their users. Many UNIX administrators mock the model that the personal computer industry has adopted as normative since the early days of Novell NetWare. The old perception of the necessity to keep users off file and print servers was a result of fears concerning the security and integrity of data. It was a simple and generally effective measure to keep users away from servers, except through mapped drives. UNIX administrators are fully correct in asserting that UNIX servers and workstations are identical in terms of the software that is installed. They correctly assert that in a well-secured environment it is safe to store files on a system that has hundreds of users. But all network administrators must factor into the decision to allow or reject general user logins to a UNIX system that is principally a file and print server the risk to operations through simple user errors. Only then can one begin to appraise the best strategy and adopt a site-specific policy that best protects the needs of users and of the organization alike. From experience, it is my recommendation to keep general system-level logins to a practical minimum and to eliminate them if possible. This should not be taken as a hard rule, though. The better question is, what works best for the site? The manual page for this winbind trusted domains only parameter says, “This parameter is designed to allow Samba servers that are members of a Samba-controlled domain to use UNIX accounts distributed vi NIS, rsync, or LDAP as the UIDs for winbindd users in the hosts primary domain. Therefore, the user SAMBA\user1 would be mapped to the account user1 in /etc/passwd instead of allocating a new UID for him or her.” This clearly suggests that you are trying to use this parameter inappropriately. The key benefit of using LDAP is that the UID of all users and the GID of all groups are globally consistent on domain controllers as well as on domain member servers. This means that it is possible to copy/replicate files across servers without loss of identity. When use is made of account identity resolution via winbind, even when an IDMAP backend is stored in LDAP, the UID/GID on domain member servers is consistent, but differs from the ID that the user/group has on domain controllers. The winbind allocated UID/GID that is stored in LDAP (or locally) will be in the numeric range specified in the idmap uid/gid in the smb.conf file. On domain controllers, the UID/GID is that of the POSIX value assigned in the LDAP directory as part of the POSIX account information. this means that a hostname lookup first tries the /etc/hosts. If this fails to resolve, it attempts a DNS lookup, and if that fails, it tries a WINS lookup. The addition of the WINS-based name lookup makes sense only if NetBIOS over TCP/IP has been enabled on all Windows clients. Where NetBIOS over TCP/IP has been disabled, DNS is the preferred name resolution technology. This usually makes most sense when Samba is a client of an Active Directory domain, where NetBIOS use has been disabled. In this case, the Windows 200x autoregisters all locator records it needs with its own DNS server or servers. No. This is not okay. It means that your Samba-3 client has joined the ADS domain as a Windows NT4 client, and Samba-3 will not be using Kerberos-based authentication.